I see two who definitely won’t get my vote. As for the rest, will have to give them some thought. It’s gonna be a tough call. I’ll probably do a bracket. As you may or may not know, Dr. Pauly skipped town for a few days to go “see a band” (WTF?) 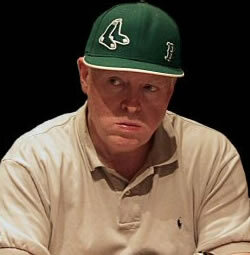 … That left Benjo and me to report on the final table of the Champions Invitational: Tom McEvoy beats Dan Harrington and Robert Varkonyi to win himself a Corvette and, of course, the plausibly coveted Binion Cup … providing him sellable items should he ever need a little bankroll stimulus. And we hear about Phil Hellmuth’s oddly graceful 10:1 hands-shaken to hands-played ratio as he, like Pauly, makes an early but not-so-unexpected exit at the WSOP … temporarily derailing an Angry Frenchman’s plans to stage a potentially violent coup. Brought to you by Phish Coventry and psilocybin. Clearly not that closely related. 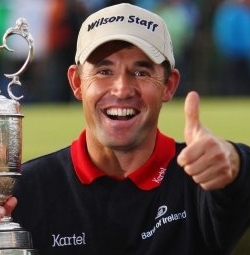 Padraig Harrington, brother not-the-brother of poker-great Dan Harrington, won the British Open yesterday at Royal Birkdale in Scotland. 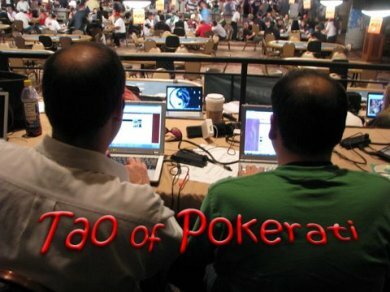 Congrats, distant-cousin (several times removed) to poker! That’s two-in-a-row at the British Open for Harrington — making him the first European to repeat in more than 100 years. Wow. Meanwhile, a lot of people have finally read and are talking about the more pokery Harrington’s new(ish) back-to-back cash game books . Supposedly they’re great — that’s what everynone’s saying. I’m starting to wonder if one of the reasons I’m doing so poorly in golf tournaments these days isn’t because I’m one of the few players who hasn’t read his Iliad on tournament play yet.